Tradition that Ruth Ellis was the last person to be hanged in the United Kingdom and that was for murdering her lover, David Blakely. Humble beginnings for a famous piece of eternity was the life of Elis, when she shot her lover dead outside a pub in 1955. She gave herself up and was apparently courteous and composed as she was sent down and the judge donned the black cap. As a sideline she had to put on a pair of thick padded calico knickers (which was the norm since 1923, for some strange reason). Or perhaps it was just not the thing for executed women to have their bowels drop out as they passed over to the other side, with a bit of a push and a shove. But, Elis was not the last person to be executed in the United Kingdom, or so it would seem. The British are ready to hang themselves yet again, with their General Election on Thursday 7th May 2015. Just a few days away from the latest execution that the country will see itself go through as nobody gains the majority of the House of Commons and nobody is able to govern the country. Is the country ready to be hanged, drawn and quartered by the political parties that are vying for the favors of the few that will vote? The First-Past-the-Post System was once notorious in political science for returning a clear winner, for ousting everyone but two major parties. But, these days nothing seems sure any more. Even the British have become lost in the turmoil of the tidal wave of the financial crisis. So, why is Britain ready to hang itself? Employment might have stagnated for two years immediately after the last UK General Election in 2010, but since 2012 they are on the up and they have never been higher. Prime Minister David Cameron was even using a foghorn to attract the attention of the public to the fact that they are at the highest levels since records began in 1971 standing at over 73%. They are now at higher levels than the pre-crisis period, but the British just can’t seem to hear him. The employment rate for women stands at 5%. Of course the British can’t see the effects on the economy because the jobs are mostly in sectors that traditionally pay far less than any other. The vast majority of those jobs are in sectors that are 20% below the national average in terms of wages. But, yes, apparently wages were up in 2014 by 1% on average. That means that some are raking the pounds in. But, in real terms, taking inflation into account, that rise in wages is perceived as a fall. By comparison with other recessions that our economies have been through, wages have tended to stagnate or slow down when looking at median real wage growth. But, since 2008, this has no longer been the case. Britain has suffered falling real levels. The median worker has seen their wages fall by 8-10%, working out to about 2% per year under inflation since 2008 across the country. The only exceptions are those at the very top who have continued to earn the benefits. Youth real wage falls (ages 18-24) have been in the region of 15%. But, economists believe that real wages have become disassociated from productivity today and whatever the gains that are made in terms of output in the UK economy, they will no longer be felt in the real wage statistics. Inequality has increased average earnings, but average ages are still not seeing that benefit. The growth in productivity is immediately absorbed by the highest wage-earners rather than being spread across the country. According to a CFO Survey on the Risks to Business the UK General Election is becoming an increasing source of worry for business in the country. In 2014 just around 50% of UK businesses polled were worried about the General Election; that figure now stands at nearly 60% of companies. Similarly, over 55% of business are worried about a future EU referendum in the UK. Last year the figure was again around 50%. Current receipts and expenditures as a percentage of GDP show that all austerity and budget cuts have done is to decrease spending but not increase tax receipts. As a consequence, the UK deficit is still there as big as it has always been. Austerity is a means of telling the population outwardly that they have to make an effort. But, it doesn’t create enough wealth for the country to increase tax receipts and reduce anything at all. 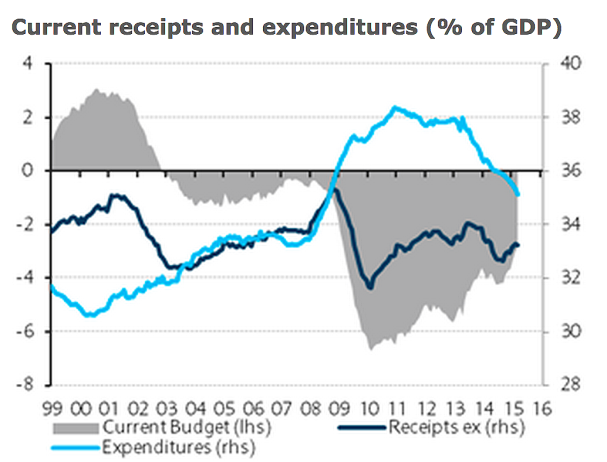 The chart from Barclays shows exactly current receipts and expenditures as percentages of GDP. So, who will it be then? David Cameron for the Conservative Party, Ed Miliband for the Labour Party, or Nick Clegg for the Liberal-Democrats? Will Nigel Farage for UKIP be in there too? Or will it be all four of them in some combination. What will be the outcome on Thursday May 7th and who will be donning those thick padded calico knickers this time? At any rate, they should all have a pair on as the possibility is now a certainty that they will have to work together this time again, scheming and plotting to maintain their lifeline to the corridors of power and the coffers that need emptying just a little more. What’s your bet on the outcome of the UK General Election?